Join us on Tuesday, July 30th from 6:30pm - 8:30pm for our 10 Year Anniversary Party and No Boundaries Finishers Celebration! It's hard to believe that ten years has passed since we first opened our doors at 604 Washington Street. To celebrate, we are holding an Anniversary Party at the store! We will also be celebrating our Spring No Boundaries Training Program for completing their first 5k! 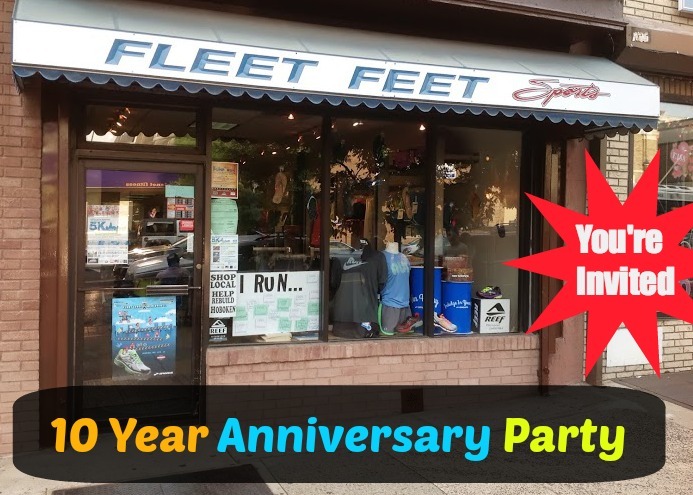 6:30pm - 8:30pm: Come by anytime for refreshments, drinks and a celebration sale at Fleet Feet Hoboken! Please RVSP today so we can be sure we have enough food, drinks and cake!